We invited them along to meet the team and sample some of the activities planned. This way they could be confident about referring some of the vulnerable women they work with. Our Outreach team have lots of experience in creating engaging sessions in a safe space. Their approach and activities help draw parents in and build bonds of trust between the women attending and themselves. We wanted professionals to get a feel for this. The response from those that attended was extremely positive. "I loved the activities. I think it will be very empowering it will allow families to open up to each other it helps them to express and opens them ujp to new ideas. It will be an excellent opportunity for parents to learn from one another. "I am happy I got a taste of what I am referring families to and what they will be experiencing once they are here." "It was really more than I expected. The levels of reflecting on yourself and empowering yourself as a woman - I found it really useful." 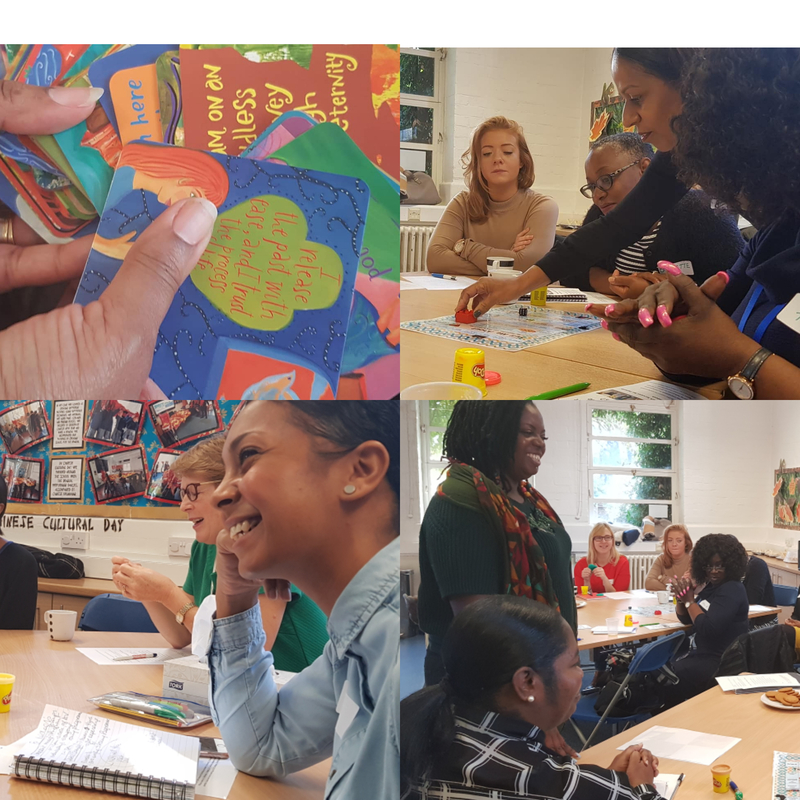 Both Sheila and Ayoola, who will be running the programme, have experience setting up and running support groups and with working with women who are victims of domestic abuse. There will be a rolling 12 week cycle of activities which women will be able to take part in. It has been designed so it will be easy for them to come and get involved at any stage of the programme. Both Sheila and Ayoola are very experienced and will make sure women feel comfortable at whatever stage they join the group. Ayoola, one of the practitioners running the support groups, took professional through the types of group activities and discussions. This began with a fun board game to ease everyone in before the more in depth and challenging discussions took place. Everyone was laughing and sharing information about themselves and what they knew about random things like elephants! It definitely got the conversations flowing. Questions were asked about how women who join the programme half way or near the end would be supported. "It will be explained that the programme is rolling and subject will have been dealt with earlier. This might feel a bit daunting to them initially. But they will be given a briefing before the session to prepare them for what will be covered that week. We aim to have an open, friendly atmosphere with plenty of fun to welcome everyone that joins," Ayoola told the group. Someone asked whther the content and the topics for the group sessions would be given to the women in advance, in case women didnt feel ready to talk about these things. "Often the topic one wants to avoid is the one most useful or needed. However, if requested this information will be provided," Ayoola explained. Leap have funded this work because of the considerable evidence that shows how domestic abuse and unhealthy relationships can impact on the lives of children who experience or witness them. The hope is that by getting in there early, and supporting the women in these areas, we can make sure their children grow up feeling safe and secure. The two new groups start on Wednesday 14th November at Henry Fawcett Children's Centre . However, women can join the programme at anytime.